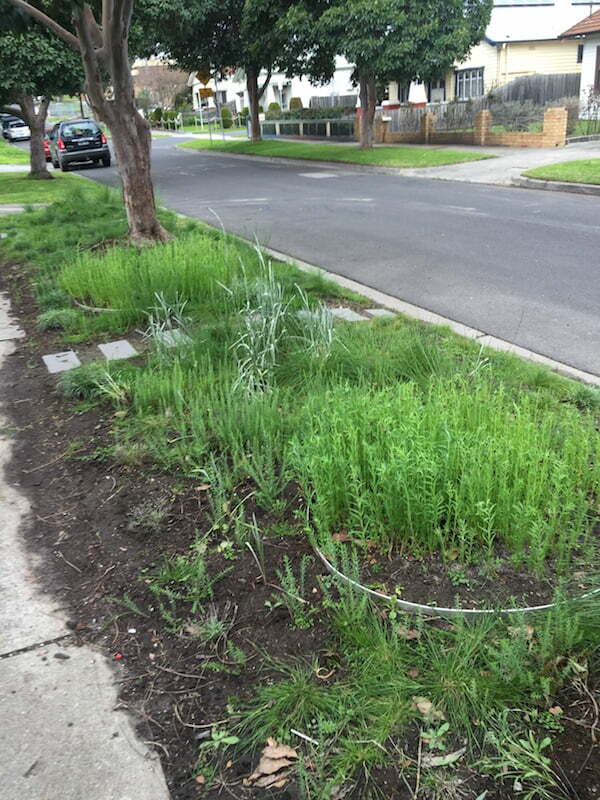 This is the second in a two part series about establishing native Australian grasslands in a garden context, specifically for nature strips (aka front verges) in the Melbourne area. (You can find information about why you should grow a suburban native grassland and then preparing your garden here in Part 1 How to grow a native Australian grassland). Creating a native grassland is a uniquely Australian take on the prairie school of gardening and arguably better suited to the local climate than exotic species. I’m not an indigenous-only gardener by any means, but my work has seen me develop a deep love of native grasses. I use them where I can in my gardens because they have virtues, and precious few others seems to be extolling their usefulness in developing a prairie style all our own. 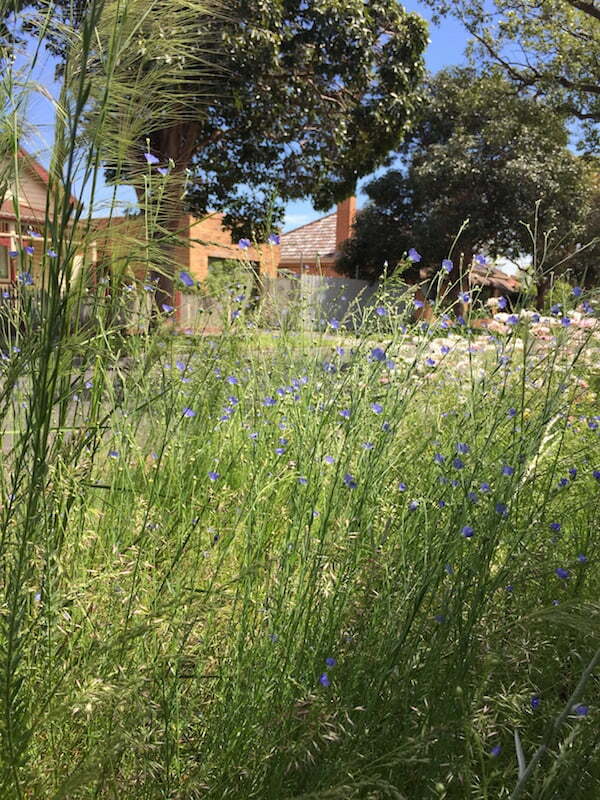 As Australian gardeners we’re behoved to experiment with our native grasses. They need more devotees! My nature strip is planted almost exclusively with local species, with one exception that I’ll get to later. One big difference between the prairie school and native grassland plants is their ultimate size. The exotics are big and bold, whereas local grasses are smaller by comparison. This does not mean the locals are less showy, the locals and the exotics share more similarities than differences. Like exotic grasses, local grasses remain ornamental over long periods with seasonal peaks and troughs. Let me stress, they’re more peak than trough! The overall aesthetic is one of great Australian beauty that continually changes with the seasons. One important distinction with native grasses should be made before plunging head-long into the detail. Native grasses are divided into two categories, roughly speaking, cool (C3) and warm season (C4) grasses, which refer to the time of year they are actively growing. The C3/C4 epithet refers to the carbon dioxide uptake mechanism they use in photosynthesis. 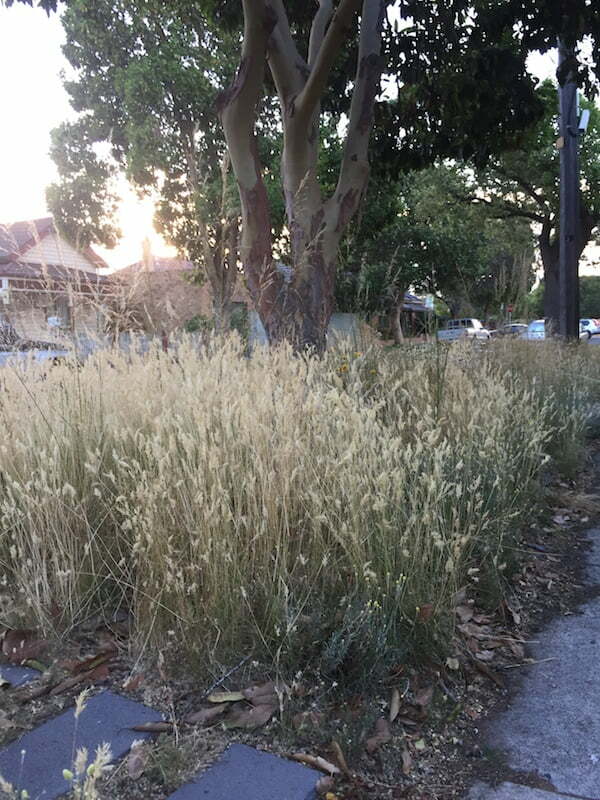 I’ve used exclusively cool-season grasses because they grow when rain is reliable and plentiful in Melbourne – I have never and would never turn a hose on my naturestrip! For an excellent explanation and species list of C3 and C4 grasses, see this link. Having prepared an area for creating a grassland, choosing species is the fun bit. For reasons of brevity I’ve divided the species you can use into three categories, each with their own important function in achieving the look effectively. The first is fillers, the second is forms and the last is features. You want a filler, a single species to make up the bulk of the grassland. Choosing the right species will depend on a lot of considerations. The biggest I had was space, my grassland is a small 2.5m X 8.5m naturstrip afterall, so I had to choose a very low growing species. I chose kneed wallaby grass as my filler, Rytidosperma geniculatum. It’s a tuftie to about 10-20cm high, flowering at around 30cm. In time as they fill out and competition really gets going they will be much lower, below 10cm and flower just above the foliage. This has already started happening some 3 years into my grassland’s life. When choosing grasses for form, go for larger tufting species. 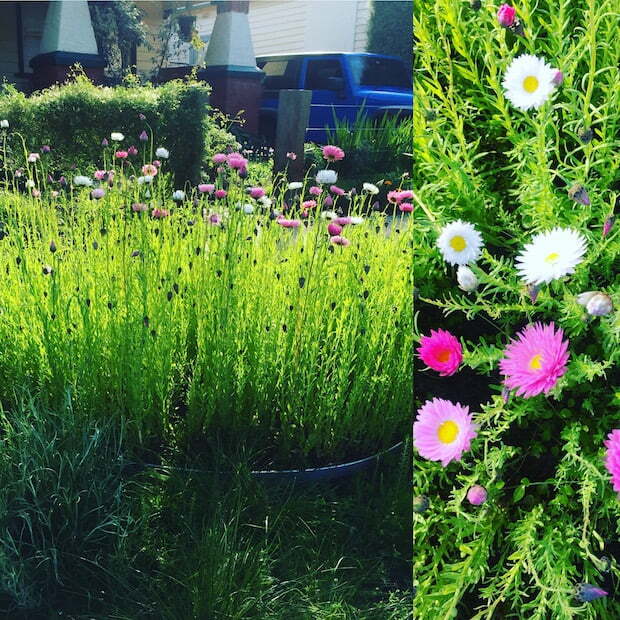 Both form and filler should make up to 80% of the total planting – the relationship between them is vitally important to the aesthetic. Think of them as groundcover and upright accent plants – there should not be too many of either, a combination of the two that is ‘just right’ to please the eye. Poa lab for form is a classic and proven performer, though I’ve limited its use to direct foot traffic around my planting, hoping it would deter people from cutting through it. So far it’s worked brilliantly. My main form grass is Poa sieberiana because it doesn’t get as tall as poa lab, roughly about a third to half the size, with a similar habit. Features is where you really get to let rip with colour. As with all garden design, choosing your mix of colours is important. There are many cool-coloured native flowering species, but just as many hot colours. But hot colours tend to be different shades of yellow in the main, not many local plants provide long periods of orange, a great many fewer still where red is concerned. I chose a mixture of native flax, Linum marginale, and the ever-wonderful billy buttons, Pycnosorus globosus as a contrasting blue/yellow colour scheme. The only non-indigenous plant I used in my grassland was the annual Western Australian paper daisy, Rhodanthe chlorocephala subsp. rosea. I sow them every year in metal rings I set into the ground. In spring, boy do they put on a show. They have literally stopped traffic in my street. One important thing to keep in mind with features is that there are also grasses that fall under this category. The spear grasses, Austrostipa spp., are invaluable for seasonal feature. I’ve used Austrostipa rudis subsp. rudis as a seasonal accent and it works brilliantly. It’s a narrow, upright tufting grass with foliage reaching only about 20cm in height, but the glumes it puts up are are 60 – 100cm tall, airy, breeze-catching and showy. I planted it because I wanted the glumes a good head and shoulders above the rest of the plants – it was to act as the ceiling for the planting and it has performed the role very well indeed. Even after it sheds its seed, the glumes are retained for many months of delight, catching breezes and afternoon sun in equal measure. Whatever mix of grasses and flowering plants you choose an important consideration when it comes to planting is buying tubestock versus direct seeding. There are a number of suppliers* of native grass seed that provide a good range of the ‘filler’ species, and direct seeding as much of these as you can is not only more economical, but the plants themselves will tend to be more robust. Tubestock has a tendency to do well for a few years, erupting out of the ground, but the phrase living fast and dying young applies to tubes more often than not. They’ve spent their entire lives mollycoddled in tubes at nurseries and once planted out, despite looking great for the first few years, can often give up the ghost well before a plant that’s directed-seeded will. My strip is 2.5m X 8.5m. 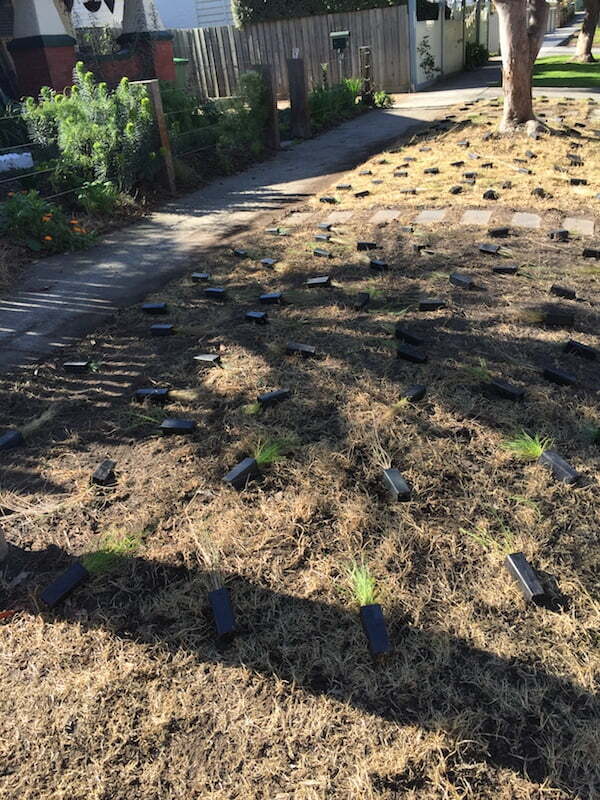 I used 110 tubes of ‘form’ and ‘feature’ grasses oversowed with seed of my ‘filler’ species. Plant densely to crowd out unwanted weeds. I always over-plant as grasses are very good at self-thinning down the track. Have at least 5 plants per square metre. The economics of directing seeding are another argument in its favour. To fill out an area the size of my grassland, I’d need at least 100 tubes of my filler species, kneed wallaby grass. At around $3.50 a pop, costs begin to approach preclusive. A 250g bag of kneed wallaby grass seed was more than enough to cover my naturestrip (front verge) – after killing off the grass in autumn I just raked the grass and soil over and broadcast it everywhere. It germinated prolifically and continues to fill out wonderfully. Where form and feature plants are concerned, tubes will do the trick. Many of these species will self-seed well, so if the original plants die it’s not a big deal. Poa lab can be replaced and will give you a good clump in 12 months or so. The term recruitment is just another word for self-seeding. Mulch will significantly impede the recruitment of grasses and flowering plants in grassland settings. Mulch also breaks down and adds nutrients to the soil – this is a significant consideration in ongoing weed management in grasslands. Many native grassland plants have adapted to grow in nutrient-poor soils, the kind of soils that a lot of problem weeds find it difficult to get a foothold in, especially once grasses become well-established. This ecological characteristic can inform smart ongoing weed management with a great deal of success. Wallaby grasses are prolific seeders with a high viability. Mulch will not do them any favours! It’s almost counter-intuitive not to mulch, every gardening resource has told us for years that mulch is invaluable for retaining moisture and protecting soil, and it is all true in the right context. Native grasslands in the natural style I’ve planted mine are not the right context. If I used mulch I would have enjoyed nowhere near the amount of recruitment that’s gone on. 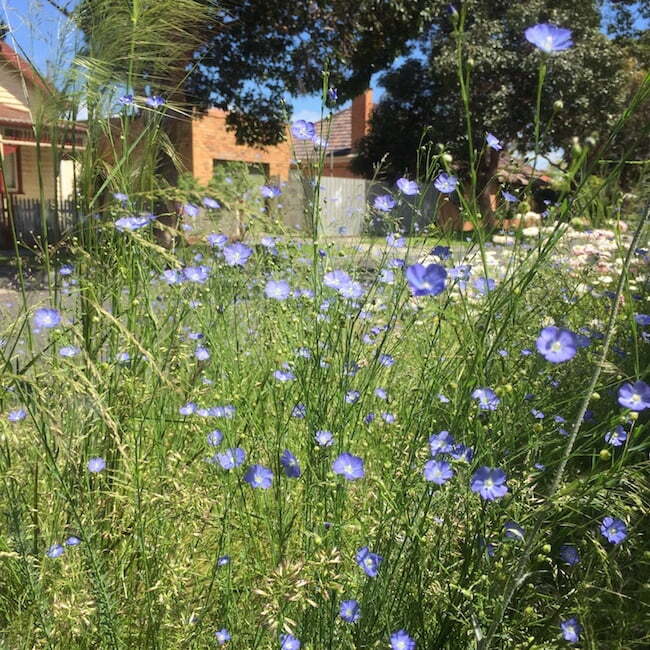 The native flax, Linum marginale, went from 20 tubes in their first year to literally thousands of seedlings over the ensuing two years, creating great drifts of blue in springtime. Their seed ripens in early summer, is shed and sits waiting until the cool months return before doing it all over again. The same goes for the spear grass and the wallaby grass I used. One the most enjoyable things about growing grasses in this naturalistic style is watching the ecology evolve over time. From the original tubes of spear grass there have popped up many more in areas I thought they might struggle to gain a foothold. This is particularly beneath the brush box street tree that’s smack-bang in the middle of the planting. In late spring and summer the tree’s trunk is clothed in swords of spear grass glumes, it’s delightful. Grasses are great niche-fillers and will readily spread themselves around areas they find the most hospitable. However, if you wanted to go for a more stylised planting, keeping different species in blocks of textures, then mulching would certainly be appropriate. Once you’ve prepped, sowed and planted the battle against weeds should begin straight away. The price of a good-looking grassland is eternal vigilance. In the first 12 to 18 months be prepared to do a lot of hand-weeding. This first establishment phase is critical, as once you begin to get a good coverage of grass the weeds naturally reduce in number, becoming easier to spot and pull out. If you’re down there pulling weeds and checking things out you’ll quickly learn the difference between weedy grasses and the locals. For those worried about identification of young plants, you can leave them until they begin to mature and flower, by which stage there’ll be little doubt as to their identity. A good rule of thumb for beginners in this respect is that local grasses, even young plants, tend to have easily distinguishable hairs on the blades, whereas many of the weedy grasses do not. A major undertaking in grasslands at least once a year is biomass reduction. By the end of summer there will be a lot of dried up glumes and thatch dagging about. This coverage needs to be dealt with. Back in the day grasslands would be burnt by indigenous people to regenerate them. The good news for the non-pyromaniacal is that the same effect can be achieved with a brush cutter or a high mow-and-catch. My grassland takes me about half an hour to give it a low brush cut in late summer, just before the cool weather arrives and growth starts to get going again. A slow, cool burn is the key. Seeing as we’re talking about fire, you can use it under extreme caution as a tool in your weed management arsenal. I used it successfully this year in my strip after noticing that a particularly pernicious annual weedy silvergrass, Vulpia spp., appeared in alarming numbers. Fire was highly successful at controlling it. Flame will not kill local grasses but it’s a proven method for dealing with problem annuals. The trick to burning is getting your timing right and this is mainly experiential. Never burn in hot, windy weather. Aim for a slow, cool burn when the weather is amenable, either in spring after the first flush of seed or use a weed burner to spot-burn young annuals as they appear in late winter/spring. Do not burn your grassland at the end of summer when there’s an abundance of dry material – it will burn extremely fast and hot, which isn’t ideal both ecologically-speaking and from a safety point of view. Native grasslands are a very beautiful thing and once you get them running they are really very easy to look after, it’s getting them to that point that can be a hard slog! But like any great garden it is worth a thousand hours of effort to achieve. While mine is still only in its infancy I’ve already drastically reduced the amount of time I spend maintaining it, and it looks fabulous for months on end and changes with every passing week. Being the creator of an emerging ecology is a very satisfying experience, and there’s immense enjoyment to be had with grasslands on that front alone. I dare you to give it a go! Wonderful article, thanks James. ‘Thoughtful, skilled horticulturist creates beautiful planting, which brings joy to himself and others.’ Now that’s a good Christmas garden story! Thanks James, I’ll be using your article as a basis for planting my own nature strip. The council is narrowing our road and widening the nature strip by about a metre (bonus!). I’ve requested they don’t sow lawn seed so I should have nice, bare earth to work with. As I need to maintain pedestrian access and not use plants higher than 500mm, I’ll go for the more stylised approach with mulch between plantings. I’ll cross reference your suggestions with my council’s list of indigenous grasses and take it from there. Great article! A question – after scalping the soil, what (if any) soil type should be aimed for before planting? 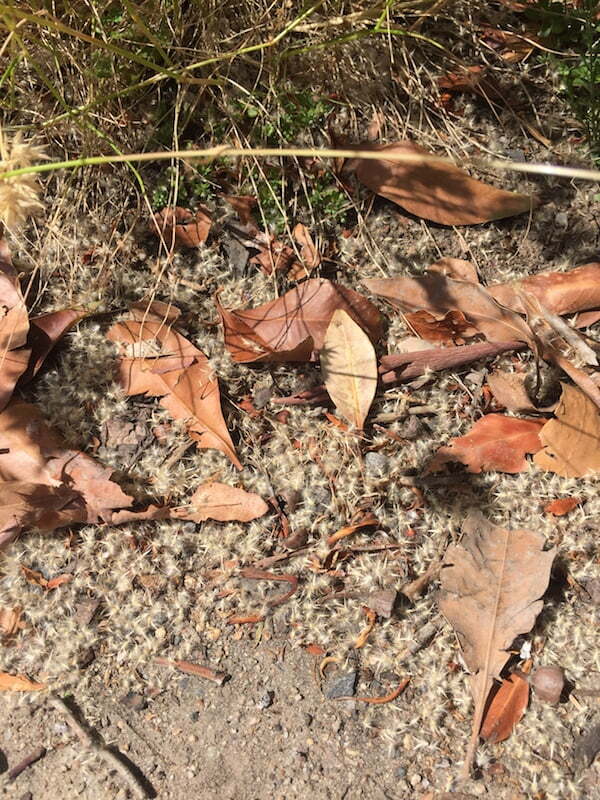 I am looking to use grasses along with some small native shrubs to fill in a strip of very sandy/rubble on sandstone base (im in Sydney), leftover after some landscaping in my yard.